I knew Mario Cuomo well. Too well. I helped write talking points for speeches that got him elected Governor and grieved that he did not become President. But there was another Cuomo, the one that tried to stop the US publication of my book, The Best Democracy Money Can Buy; the Mario Cuomo who went to court to try to put the Palast Investigative team out of business while we worked to expose the Bush Family election heist and the con job leading to war. I just read the glowing New York Times obit. Even in death, Cuomo has pulled off one last con. The Times lauds his single stellar accomplishment as Governor: “He closed the Shoreham nuclear plant on Long Island,” New York. No, he didn’t. As usual with Mario, he gave a great speech””and won election by calling for the nuclear plant’s closure. But behind the scenes, the other Mario, the back-room wheeler-dealer, the toady to the bankers and power industry magnates, moved heaven and earth to stand in the way of the courageous statesmen and activists who actually closed this dangerous, radioactive monstrosity. The bill passed the next day””and Cuomo made a big show of signing the bill he secretly tried to dilute and kill. But I admit, he gave a great speech. After nearly a decade of investigation, I recommended that the government bring civil racketeering charges against the builders of the Shoreham nuclear plant, for, among other frauds, falsifying records on the plant’s earthquake safety and emergency diesel generators. [See the “Fukushima, Texas” chapter in “Vultures Picnic.”] Charges were brought, and a federal jury found the nuclear industry bigs liable for conspiracy, fraud, and racketeering. The jury award would cost the plant owner $4.3 billion. In public Governor Cuomo praised the jury verdict; but behind the scenes the other Cuomo went to work, scheming in back rooms to cut the award and save the company from bankruptcy””and save the banks that held its bonds. Daily, the judge’s master would tell us, “The Governor called again.” There’s nothing corrupt or illegal about the Governor secretly calling the judge’s chamber, just two-faced and sickening. Cuomo won. He got the case settled, over the objections of the officials and activists who had brought the charges, for less than a dime on the dollar. The public got shafted out of billions, and the company and banks were saved. Cuomo took full credit for putting the rogue company out of business, for closing the plant and buying it for just $1. It was a great speech””a great fairy tale. 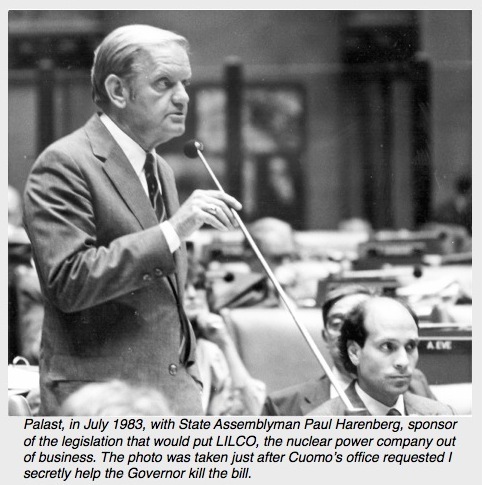 Cuomo’s little games meant the nuclear plant would cost the public billions of dollars, not a buck. When I tactfully explained this uncomfortable fact to the Governor, he responded with an Italian gesture that cannot be translated in a family newspaper. But duplicity has its price and the Devil has the last laugh. While Cuomo was pleasing the bankers in private while publicly waving the liberal anti-corporate banner, a much brighter politician in Arkansas both pleased the bankers and sang their praises. The bankers’ favorite, their champion of the deregulation that Reagan could never dream of accomplishing, became President. And Cuomo spent his last, bitter years trying to hush up those like me who cast a shadow on his fabricated Glory Days. Let me name a few of those who did close the Shoreham nuclear plant: Peter Maniscalco, Nancy Newell, Steve Liss. Paul Lozowski, Marge Harrison, Dave Sprintzen, the Hon. Wayne Prospect and the Hon. Paul Harenberg. I name them here because Harenberg, the sponsor of the law that actually closed Shoreham, passed away two years ago””and did not rate an obituary in The Times. They are the heroes, all of them bullied by Cuomo but unbowed. I cherish them for their actions, not their speeches. It is the harsh and uncomforting work of a journalist to reveal the unforgiving facts when history is falsified. It’s a task I would rather avoid, especially now that The Governor’s great, golden voice, the voice that spoke for the working person, is silenced forever. The conflicted soul he carried within him must have been a terrifying burden. Now, may you rest in peace, Mario Cuomo. Both of you. Greg Palast is the author of the New York Times bestsellers Billionaires & Ballot Bandits the The Best Democracy Money Can Buy and the highly acclaimed Vultures’ Picnic.